Ensuring quality in early years services is essential for young children's well-being and healthy development. The Early Childhood Development Quality Assessment Tool or ECD QUAT developed by ICDI is a free and accessible tool for practitioners, parents and communities to jointly measure and improve the quality of services where young children spend their time. The six dimensions of the ECD QUAT: child friendliness; connectedness; safety, health and protection; staffing; sustainability and agency are based on the UN Convention on the Rights of the Child. ICDI believes that quality measurements gain additional meaning when framed in open and ongoing discussions, where contextual variables, inputs from all stakeholders, values, visions and dreams all have a place. Ultimately, there has to be a commitment by all involved to improve quality for children and their families. The ECD QUAT is designed to support this process. It can be adapted for use in a wide variety of services for young children such as daycare centres, pre-schools, kindergartens, toy-libraries and home based provision. 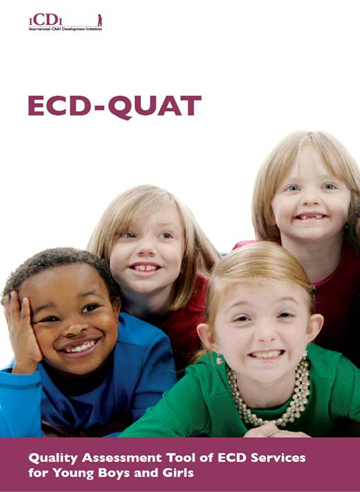 The ECD QUAT is also available in other versions: for toy libraries, for ECEC Play Hubs.